The Beautifully Updated Windsor Castle awaits your arrival at the prestigious resort of Windsor Hills. Stay in your own 6 Bedroom Castle and live like Royalty during your time in the Orlando area. Formal Living Room is bright, welcoming and inviting . The perfect place to start the day with a cup of coffee in the morning. A comfortable space to relax after a busy day. Complete with sofa and love seat. Enjoy the Fully Equipped Gourmet Kitchen. When it’s time for breakfast, don’t stress about packing everyone up and getting everyone to a restaurant, this kitchen is extensively equipped with every modern convenience. Open plan and located off the family room it has everything you need to make breakfast, lunch and dinner right at home! Formal Dining Area comfortably seats 8 around a beautiful wooden table with attractive settings. Family Room is the ideal place to relax in style together as a family, large screen 50” set with home cinema system, cable TV, DVD player makes this the best place to watch TV or a movie. Complete with sofa and TWO love seats.......everyone can have the best seat in the house! This room has stunning views of the pool and spa. With an Air Controlled cooling system, the whole family will find hours of entertainment in this room..........featuring! Laundry Room . Separate Laundry room is equipped with a washing machine, tumble dryer, iron, ironing board and additional cleaning items. Sit & Soak up the Florida Sun at your own large private pool! No rear neighbours, privacy panels have recently been added to the fully screened lanai. Use the security fencing to keep the little ones out until you’re ready! For Poolside Dining, there is a table with 6 chairs. Need pool toys? This house has that covered too! Sit and relax with a cool drink in the Bubbling Jacuzzi? Listening to that waterfall is the perfect way to end the day - This is your castle, you can do that! There are extra cushioned patio loungers, so everyone can soak up the rays. 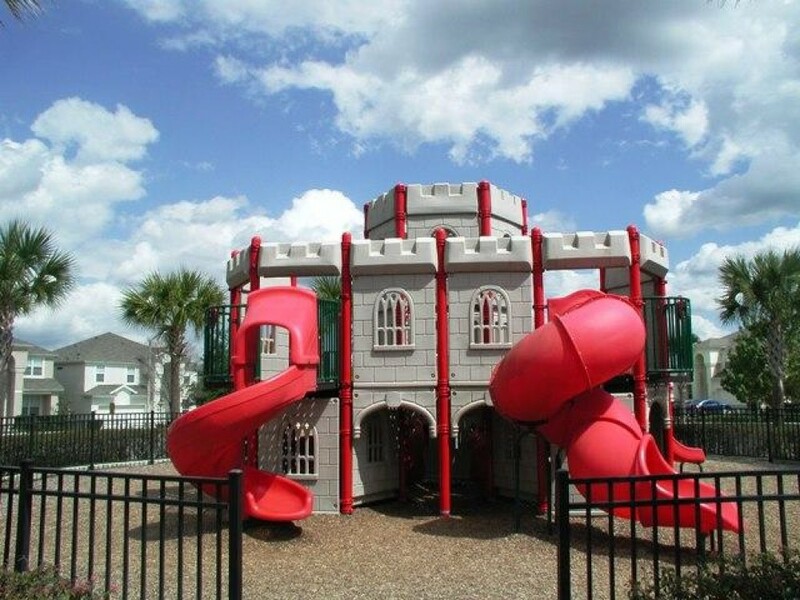 Enjoy the big backyard, a great place for the kids to play! After hours in the game room, Golfing or out at Disney and swimming in the pool, you’re going to be ready for bed at the end of the day! At Windsor Castle even bedtime is fun! There are 6 bedrooms, all beautifully and luxuriously furnished, every single one has a wall mounted flat screen LCD TV with built in DVD’s! The first is a master bedroom downstairs with pool view, queen bed and private bathroom. The remaining 5 bedrooms are upstairs. The gorgeous, extremely spacious master bedroom upstairs offers an ‘Oversized’ king bed, flat screen 32” TV/DVD and a huge on-suite bathroom complete with garden tub, walk in shower, and ‘his’ and ‘her’ sinks. Separate toilet and a large walk-in Closet can be found off this master area. The 3rd bedroom has a King bed. This fresh, bright and airy room overlooks the pool and has a flat screen TV/DVD and a ’HUGE’ walk-in closet. There are two additional bedrooms each with two twin beds. Rooms perfect for you Prince and Princess’s, for the boy’s; Mickey artwork on the walls, the second bedroom is as pink as pink can be, and just the perfect place for a princess to rest her head. The 6th bedroom upstairs is a beautiful, tastefully decorated, sunny room with a King bed, large closets, en-suite bathroom and, of course, a flat screen TV/DVD! There is an additional bathroom upstairs, with ‘his’ and ‘her’ sinks, a towel closet, and a bath/shower. The separate toilet, shower and sink areas allow for multi-use........more than one person can use this convenient bathroom at the same time! There is also a desk/office area in the hallway upstairs, complete with Wireless Internet Computer, Printer & Fax machine for your use. The Castle is fully equipped for all your holiday requirements. Plentiful supply of ‘only the best’ linens for all Bedrooms & Baths. Top quality Towels & Pool Towels are provided. Prior to arrival, for your convenience the Castle is prepared with essential supplies. In each of our bathrooms you will find a hairdryer. Free High-speed Internet connection. Free, USA & Worldwide telephone calls. To accommodate our ‘younger guests’ the Castle is equipped with a deluxe ‘Pack & Play’, Highchair and stroller, there is ample bedding for the baby’s cot – all items are of the highest standard and as you would expect, the luxurious bedding is spotlessly clean. The ‘Castle’ offers the ultimate in vacation stay................and is Spotless throughout. A Castle Playground just for the kids with giant chess/ checkers board, and sand. Mote with giant dragon to climb on completes this medieval fortress. Inviting Clubhouse complete with resort style pool, fitness centre, Jacuzzi, movie theatre, convenience store, internet access, and concierge services. Also available on the grounds you will find tennis, basketball, mini putting green, sand volleyball court, picnic areas and 2 additional playgrounds.